The 26th president of the United States was a strong and clever man who could handle almost everything -- except his eldest child, Alice. 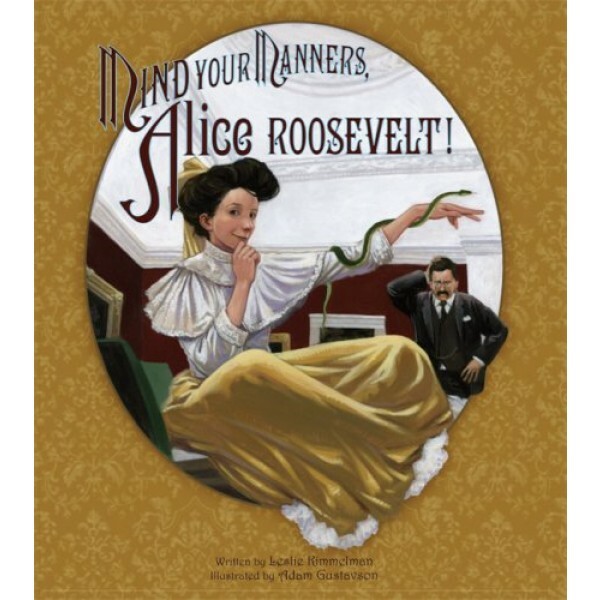 Alice Roosevelt was an independent, outspoken young woman during a time when women were supposed to be conventional and reserved. Whether it was riding a pig, keeping a pet snake, or driving a car -- and speeding! -- Alice did what she wanted to. When her father told she had to obey his rules while she lived under his roof, Alice decided to spend her time on top of the roof! Readers will enjoy author Leslie Kimmelman's factual and affectionate look at a free spirit who caught the attention of a nation in the early years of the twentieth century. Kimmelman juxtaposes Alice's antics with the achievements of her father -- from his creation of our national parks system to his successful efforts at diplomacy -- yet all the while, demonstrates a tender bond between the two. Adam Gustavson's illustrations perfectly capture the humor of the story and the strong personalities of its characters while placing the story within its proper historical context. What to Do About Alice: How Alice Roosevelt Broke the Rules, Charmed the World, and Drove Her Father Teddy Crazy!